A good character makes a lasting impression. 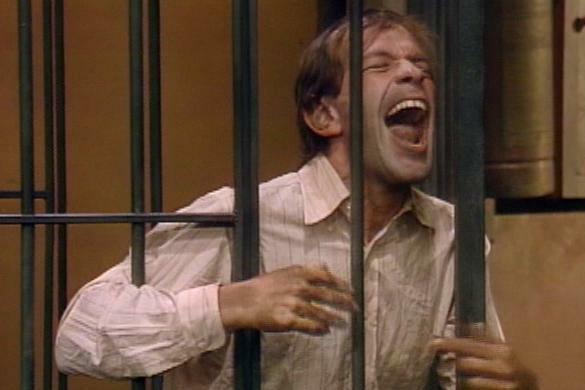 Like Big Chicken on Hawaii Five-0, Stefan Kopeckne (the other character that lead so many people to my blog) was only on two episodes of Barney Miller, but that was enough to make him memorable. 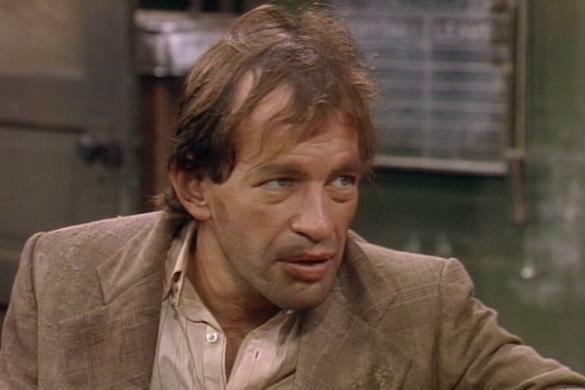 Kenneth Tigar was actually in five episodes of the show from 1976 to 1981, but it was his first and last appearances that he played the unfortunate Mr. Kopeckne. His first appearance in the episode “Werewolf” was the more memorable of the two. Mr. Kopeckne, brought into the station after causing a commotion in a park (and ruining Detective Harris’s [Ron Glass] suit in the process). Upon questioning, it’s revealed that Mr. Kopeckne believes he’s a werewolf, cursed from birth. He’s put in the cage to fret about his impending transformation which will come at midnight while the police officers just wait for Bellevue to pick him up, not really taking his claims that seriously. It’s the transformation scene that really makes the whole episode and makes Mr. Kopeckne someone to remember. He claims he can feel the hair on his legs rustling and he starts panting because his tongue is sweating, all the while Nick (Jack Soo) is trying to talk him out of it. Mr. Kopeckne climbs the bars and starts to howl when Barney (Hal Linden) comes in and yells at him, saying this is a police station, not a horror movie. In the end, Mr. Kopeckne goes off to Bellevue with some hope as Barney has pointed out that the lack of lycanthropy must mean they’ve made some progress with it. Mr. Kopeckne returns in “Possession”. This time his arrested for disorderly conduct and claims that it’s because he’s possessed. Sure enough, questionable things start happening in the precinct and Mr. Kopeckne demands that the police chaplain give him an exorcism. Not quite as good as “Werewolf”, but Mr. Tigar goes the distance with it, for sure. Really, all of the credit in the world goes to Mr. Tigar. He’s one of those actors that you’ve seen before, probably multiple times, but probably don’t know his name. The kind of guy who is so good at his craft that you remember the character over the actor behind it. He took a character that could have been absolutely ridiculous and unbelievable and gave it enough realistic gravity to make it believable and let the comedy play. It was easy to believe that this guy had a screw loose enough to think he was a werewolf, but could still function for the most part. He created a character that could have easily recurred once or twice a season without getting overdone or boring. It’s kind of a shame they didn’t. I’d have loved to see what else Mr. Kopeckne, and Mr. Tigar, could have come up with.